Hi there!! I am so excited about this release!! I think this is my all time FAVORITE release to date!! They just make you want to create!! If you just happened to be checking out my blog and want to start at the beginning click here! If you have arrived from my talented friend Ruthie you are in the right spot! I used the Bug a Boo set for my card today! Sentiment is from Bug A Boo! I also heat embossed this!! I love how it turned out! Blog Candy!! 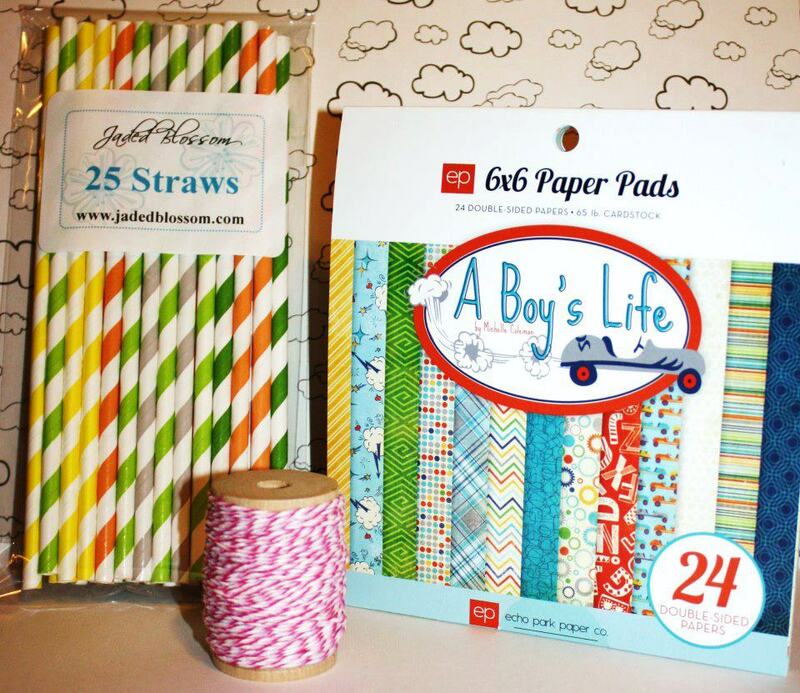 Comment on all blogs and become a follower of the Jaded Blossom blog for your chance to win this!! Your Next stop is Jamie! Kim is is my favorite too! Super cute card!! Beautiful card Kim. Love the butterfly with all it's bling. super cute girl LOVE the color combo !!! love! Beautiful card! love the colors and the butterfly. Wow how beautiful love the papers and the colors the Butterfly is Amazing. love the added bling thanks for sharing. Bug-a-boo is my favorite set! LOL. I love seeing all the inspiration from it! Thanks for sharing. I LOVE the butterfly...love the card...love the stamps. Good job Kim. Beautiful card. I love all the colors you used and the stitch look. Great job. 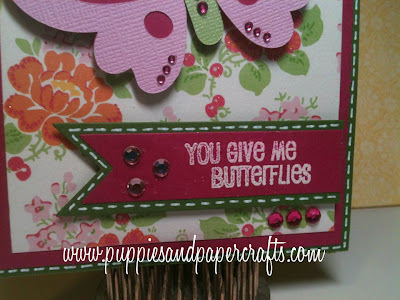 Love your blog and love your card! New follower! beautiful card! what an inspirational hop! Kim, what a stunning card. That butterfly is absolutely gorgeous. Love the colors. How cute! Love the butterfly and the sentiment is perfect. What an adorable card! I'm just loving all the projects for this hop! You did an awesome job! Outstanding, Kim! Love the color choices - TFS! very pretty card! 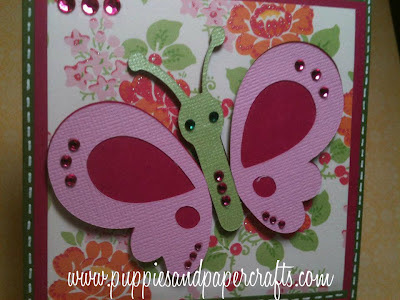 love the design on the paper and very cute butterfly. That butterfly is so super cute!! I love the bling! This also is my favorite set!!! Very cute card!!! Kim your card is so cute! I love the butterfly! And love this new release! TFS! Pretty card!! Love the butterfly!! Love your card, so darn cute! Love your colorful and blinged out card. 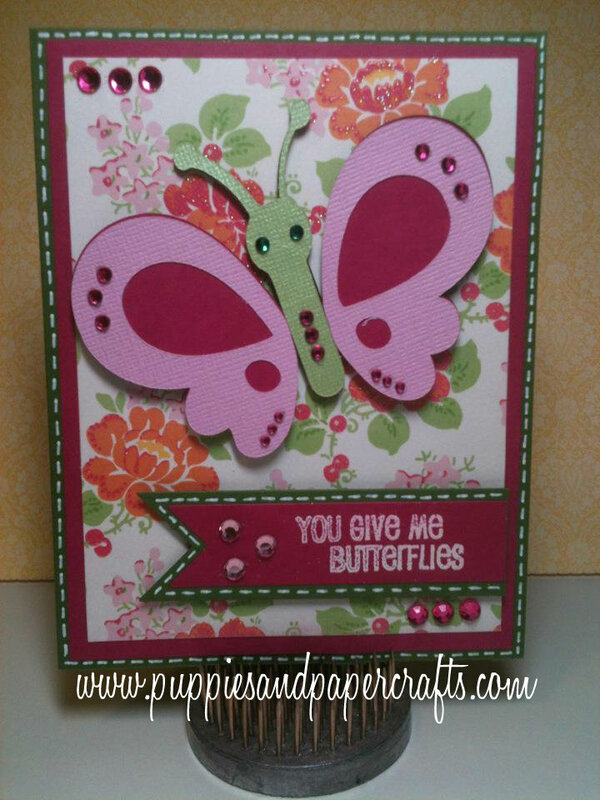 Cute card, the butterfly and sentiment are perfect! Very cute.Love the colors and gems. Cute butterfly love the new release. Super cute card Kim! Love the stamps!!! Wow, your card is gorgeous!! I love the colors, pattern paper, and bling of course..
what a GREAT sentiment for your adorable card! Way cute, love the BLING on the card super fun! Very cute card. Great job. This butterfly is adorable! I am a follower ...please visit me too! Kim, so, so pretty. I love the colors and your design. Awesome job. Love your card !! Very cute. TFS. Very pretty - great sentiment! So adorable! Love this card! Yipeeee got it to open!! This card is adorable! And I love your use of bling!!! SUPER cute butterfly!!!! LOVE it!!! Super cute Kim!!! Love all the added bling!